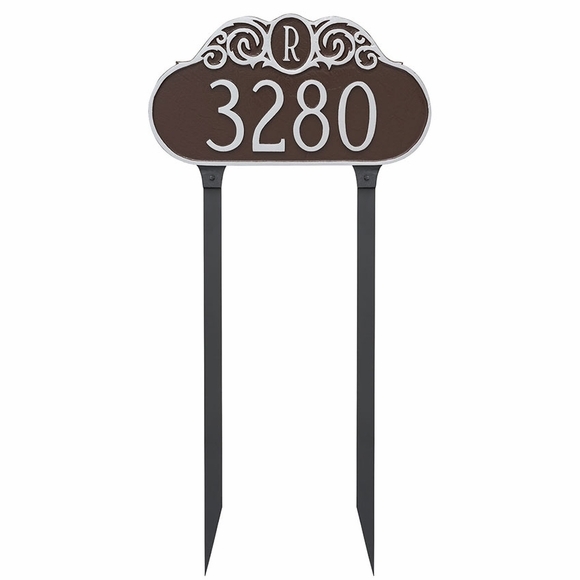 House Sign - - personalized lawn mount address sign with monogram. Oval house number sign includes a 2" monogram embedded in ornate scroll work. Made in USA. Single-line address plaque holds up to five 4" numbers and one initial. Personalized with your address number, initial, and color scheme selection. Comes with two optional 24" lawn stakes. Solid cast aluminum construction. Characters, border, and design are part of the sign, not added on. Made in the USA.